The Hero movie quotes provide the dialogue for the film about a western film actor who in old age, reflects on his legacy. The comedy-drama was directed by Brett Haley using a screenplay he co-write with Marc Basch. The Hero opened theatrically in the United States on June 9, 2017. 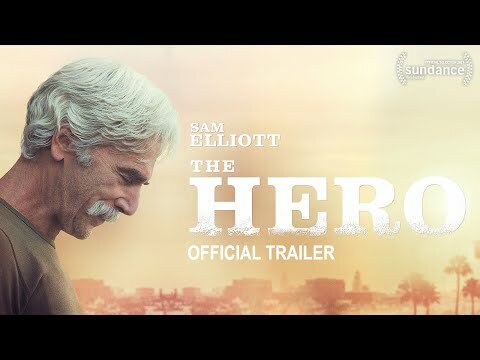 In The Hero, Lee Hayden (Sam Elliott) is a 71-year-old actor who claims just one great film on his resume, one he filmed 40 years ago. Now doing whatever work he can find, Lee spends his days smoking pot with friend Jeremy (Nick Offerman). But when Lee is diagnosed with cancer, his whole world changes. Lee reflects on his career and wonders what he really did in his life. He tries to mend ties with estranged daughter Lucy (Krysten Ritter), but Lucy isn't too interested in that. But a new much younger girlfriend, Charlotte (Laura Prepon), brings some life into the aging star, which might be exactly what he needs. The Hero was just one of several great films in theaters in June 2017 along with It Comes at Night, Megan Leavey, The Mummy, and Captain Underpants: The First Epic Movie. Engineer: That was great, Lee. Can you do one more? Lee does a voiceover for an advertisement for BBQ sauce in these The Hero movie quotes. It's pretty mundane and monotonous work, but work is work. Female Fan: Mr. Hayden, I am such a huge fan. I just love your mustache. Lee: It loves you too. Male Fan: Love you, Lee! Lee: I love you too. I am nothing without all of you. Lee and Charlotte attend an awards show where Lee receives a lifetime achievement award. As he addresses the room full of adoring fans, he expresses his appreciation for their love for him. Agent: Have you ever heard of the Western Appreciation Guild? They want to give you a lifetime achievement award. Lee: Lifetime, huh? Anything else, a job offer, a script? In a call from his agent, Lee learns that he's been offered a lifetime achievement award for his work in western films. Sure, awards are nice, but what Lee really wants is actual work. Jeremy: You trying to give me a heart attack? That was a cop knock... Are you okay? You seem a little off. Lee: I did one film that I'm proud of. That was 40 years ago. Since then I wouldn't say I've been achieving. Lee arrives as friend and weed dealer Jeremy's home and Jeremy quickly notices that something isn't quite right. Lee has been reflecting on his legacy, including the last 40 years that have been pretty sparse in roles.